Do you ever feel let down once Christmas gets here? I do. Not let down in the sense that I did not get enough gifts or I had a bad day, but let down that it is over. We look so forward to Christmas and plan it for months, and decorate for days, and cook non stop and then all the sudden it is over. I really do love this holiday. I love how it brings out the best in people (most of the time). I want to share some of our special moments this holiday season. They are in no particular order. We pray that you had an awesome holiday and that you were able to love the ones you were with. I am thankful for you, for all your encouragement through out the year. We think of you often. Reading "Twas the Night Before Christmas" and "Christmas in the Manger". BellaRose was such a good helper with some homemade holiday gifts. It is good to be momma's assistant. Just like her momma, gotta lay in the sun! This is a rare moment with BellaRose, she is actually sitting down! I have come to some conclusions about BellaRose lately. She is SO similar to Worth and me. She never stopped moving when she was in my belly, never wanted me to stop moving when she was a newborn, and still never wants to stop moving. I have to nurture this and direct this. She is a helper and a doer, if you give her a job she thrives, if you ask her to help you her whole world seems complete. It is always a nice respite for me when she does choose to lay in the sun and draw. It gives me a moment that I so desperately need at times. I appreciate what Katie told me the other day, these little babies, they are just trying to learn how to be humans. Thank you for that knowledge friend, how true those words are. So there is a little game being passed along in the blog world. You see I was tagged by Jessica to go to my 4th photo album and pick the 4th picture and put it here for you to see and to explain the picture. As you know my computer is not old so this is a tad bit boring since you have already seen the picture and you know what it is. This is a picture of the 1st scarf that I have knitted, a self portrait at that. So I decided to up the game a bit and go to my Kodak Gallery picture and pick the 4th album ever and the 4th picture in the album. This is 2004 and our little Rocco! So my job is to tag some people to do the same and I will tag Bec and Katie (and buy something off her etsy shop for Christmas while you are at it!). Do what you want with this, but no cheating unless it is a picture you just don't feel would appropriate for the internet and then by all means CHEAT! It started off as a VERY rough parenting week for me. Possibly one of the worst days yet. My Christmas joy was almost, almost stolen, but we have come out on the other end with a few lessons in tow. BellaRose is learning how to ask for things in her big girl voice, and I am constantly learning patience and to just ignore the whining. Somedays are just harder then others. 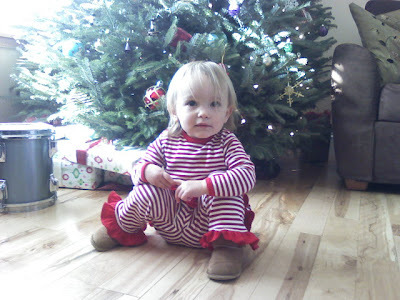 We are good now and I just had to share the cuteness that embodies BellaRose. This outfit is from T-Love and Big Poppa, how sweet! The little lights, they aren't twinkling! 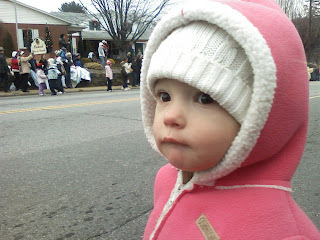 We started off the party with a trip to the Black Mountain Parade. BellaRose went last year of course but really did not know what was happening, this year was a different story for sure. She did not always get the whole candy deal. See the Black Mountain Parade is really nothing spectacular but it lasts awhile and they throw out a ton of candy. It is like it is halloween, except it is Christmas. One of BellaRose's favorite past-times is throwing things. She thought this was pretty cool, they throw her something and she throws it back to them. It was not until she ate a lollipop that she realized this was good stuff and she wanted to keep it all. 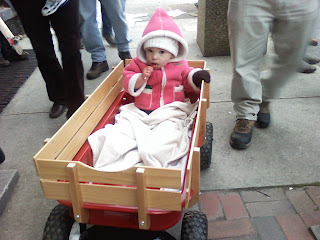 The day if anything was freezing cold and little girls hands were done! So we headed back for the main event. I decided this year we would have a "soup kitchen", perfect for sitting around a fire and watching a movie. Our neighbor Bill made White Christmas Chili. I made Cannellini with Pork and Rosemary and Chipotle Chicken Tortilla Soup, oohh yum. We also had a decorate your own cupcake station, one of my personal favorites! Thank you Dan and Annie for getting us the projector, we missed you terribly. Thank you Matt and Margaret for the extra fire pit which I am pretty sure every one really appreciated. I just love doing this party. It really starts off the season for me. I hope you enjoyed it as well, and if you did not come PLEASE just watch the movie at least once per Christmas season, the opening credits will put a smile on your face, a guarantee I can stand by! That there is an RV! It is upon us, THE "CHRISTMAS VACATION" CHRISTMAS PARTY! The lights have been strung, the tree is up, some soup has been made, the projector has been obtained. Bring some chairs, definitely bring some blankets, put on 8 layers and join us for some good times. Pictures will be posted next week of all the joy and merriment! And while we are speaking of Christmas, why don't we just compare last years Christmas tree (right) and this years Christmas tree (left). Boy oh boy what a difference. I knew I was downsizing, I just did not realize how much, of course this years tree might just be a little fatter but I pretty much hug him goodnight, every night. He is just that kind of tree! Plus he has not started dying like last years tree. Oh what a complete disaster that was. Have a wonderful weekend and whatever you are doing, just get in the spirit! So here are a whole lot of pictures for you to take in, please accept my apologies. This time of year, every moment it seems, is worthy of a picture. First we start with our Thanksgiving feast. It was FABULOUS, if I do say so myself. We had traditional flavors with a spin, nothing was really customary besides the turkey and gravy. I think it was a hit. What was not a hit was my dessert. It was pumpkin ice cream pie and so very bland and icy. Oh well! You have to have a few of those every once in awhile. The day after thanksgiving we went to cut our tree down, one of my favorite traditions! It was so much fun with BellaRose this year. She had a blast! I think what she loved the most was the dirt however. She really did roll around in it just like a little piglet. My how this baby makes us laugh all the time. She is at such a fun age right now. It is so interesting how she really does know what we are saying. One thing that got Worth and I so tickled at the tree farm was when she trying to put on her hat. She was working so hard, and it was barely on her head. She finally gets it to where she wants it and puts her hands down and says "yep" (and the tone that she said is even more priceless). Sort of like that is it perfectly! It was the sweetest funniest thing we have seen. Rainy was a little jealous of the tree so we dressed her in lights to make her feel apart of things.